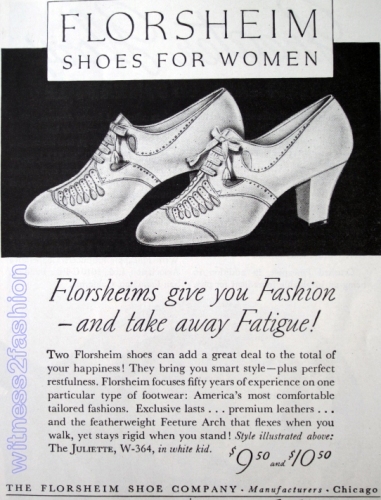 This article from Woman’s Home Companion, April, 1936, showed me that I have a lot to learn about the way shoes were perceived in the 1930s. Were white lace-up heels always for women over fifty? Did young women really wear them, too? 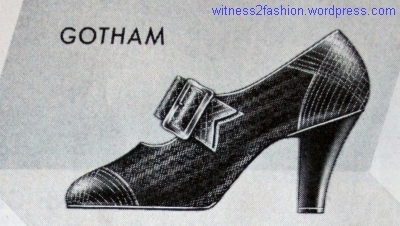 Shoes illustrated with ‘Fashions After Fifty,’ in 1937. 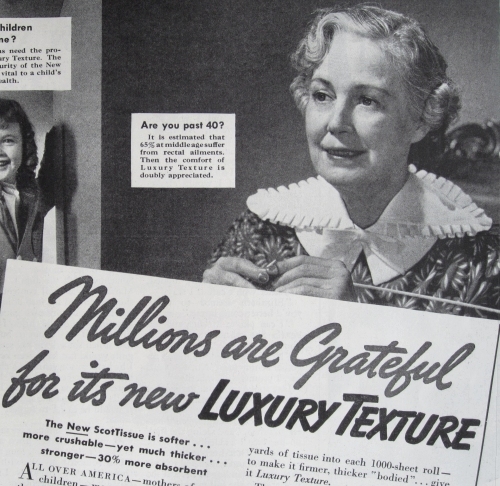 Did younger women also wear them? Woman in her seventies wearing white lace-up heels. Circa 1948. 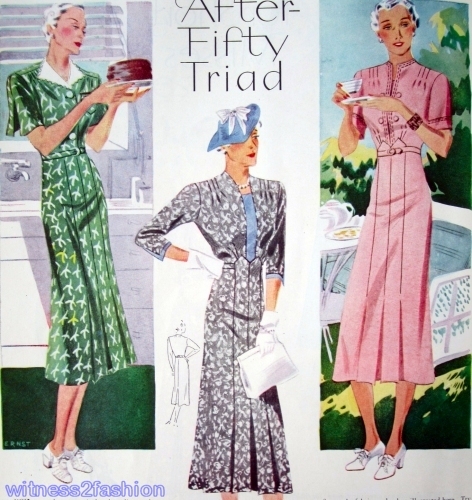 I find many thirties’ shoes stodgy looking because I associate them with “old lady shoes.” My grandmother and her friends were still wearing white, lace-up, perforated shoes in the 1950s. 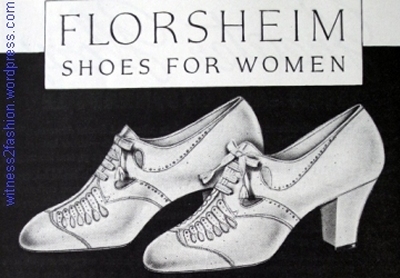 Florsheim Shoe Ad, May, 1937. 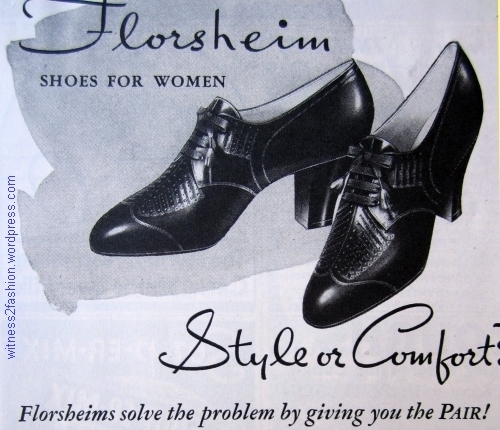 Black Florsheim lace-ups from 1937. 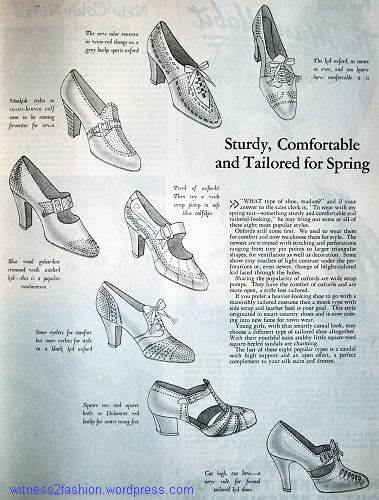 Oxford Style Shoes for Spring, 1936. 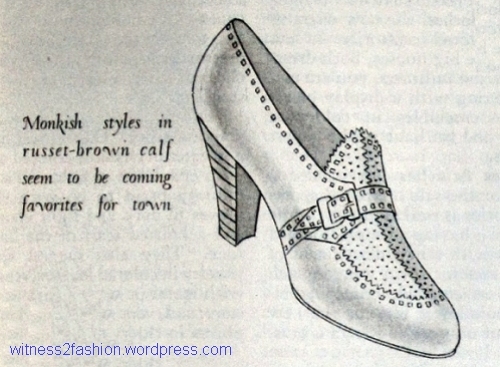 Illustration: Oxford Shoe, April 1936. 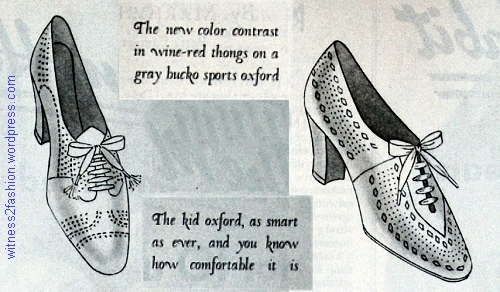 This perforated oxford was actually black, like some of the shoes in these advertisements. 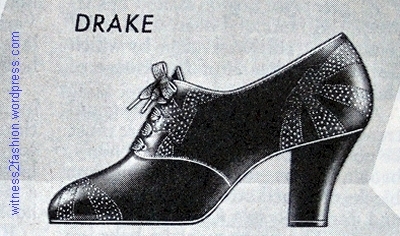 Ad for Selby Shoes, March 1936; Perforated Black Oxford. 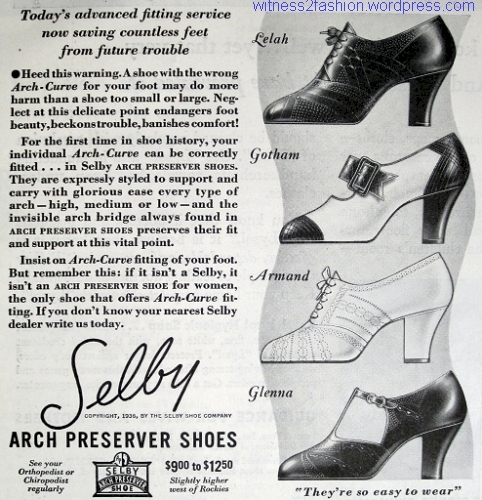 Ad for Selby Arch Preserver Shoes, May 1936. Prices $9 to $12.50. Illlustration: Wide Strap Pumps, 1936. 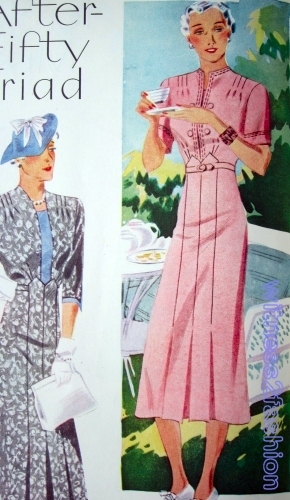 The one on the left is made of blue gabardine. It’s a little surprising that gabardine fabric shoes were popular in the Depression, since they would not wear as well as leather. 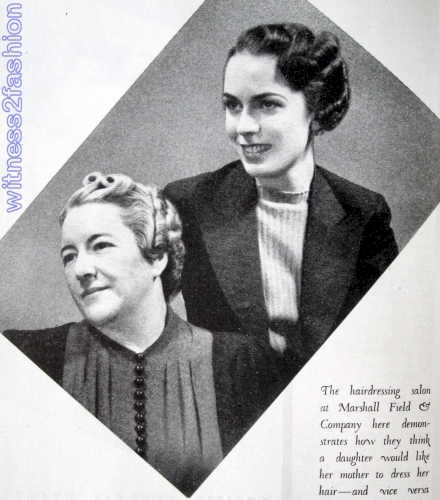 But fabric is also featured in this Matrix Shoe Ad, March 1936. 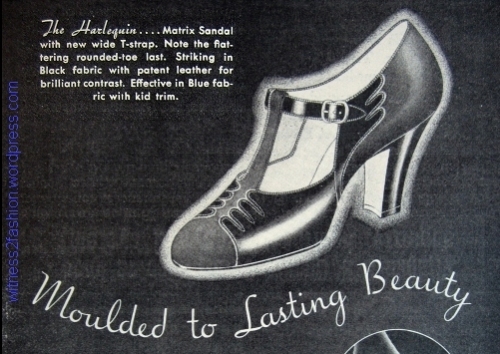 Ad for a Matrix Sandal, March 1936. Available in black fabric with patent leather or in blue fabric with kid trim. $9.00 and up. 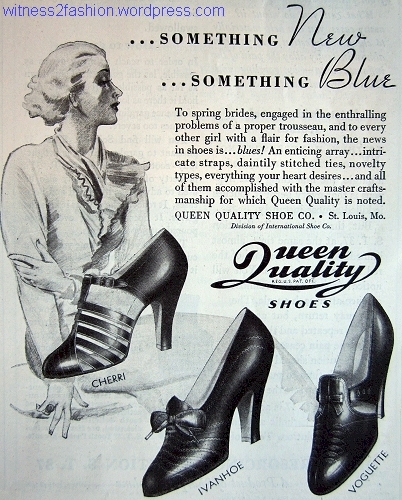 Queen Quality Shoe Ad, March 1936. 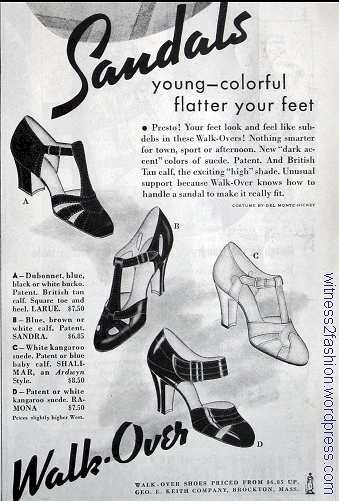 Another Wide Strap Shoe; Selby Ad, March 1936. Wide Strap Spectator Pumps and an Oxford, right. 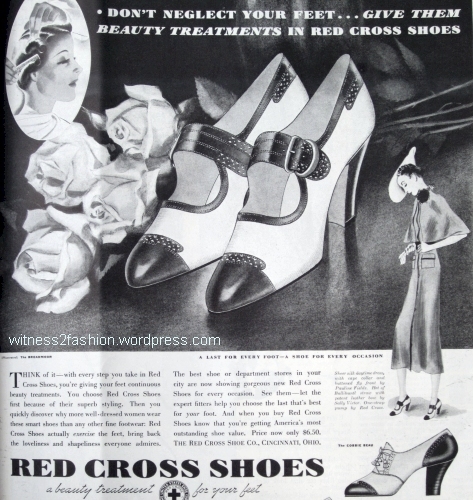 Red Cross Shoe Ad, May, 1936. Illustration: “Monkish Styles Seem to Be Coming Favorites for Town,” 1936. 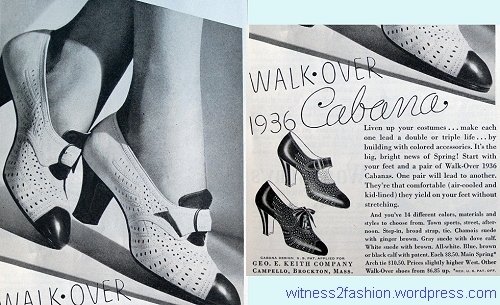 Ad for “Cabana” shoes from Walk-Over, March, 1936. 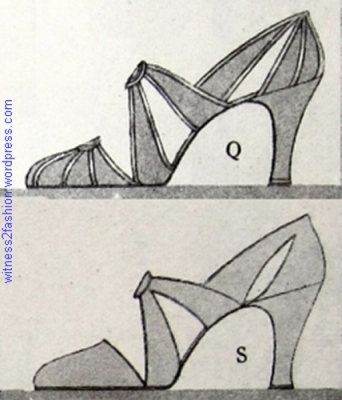 Illustration: “Square toes and square heels in Dubonnet red bucko for smart young feet.” 1936. 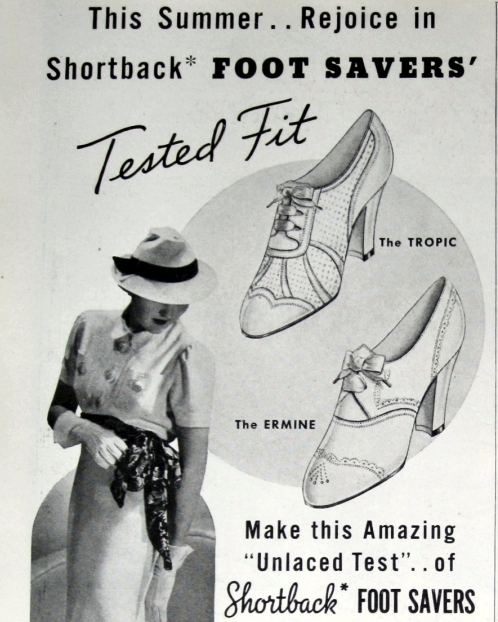 Low heeled, square-toed shoes were also available in the 1960s, but the one in this ad dates from 1936. 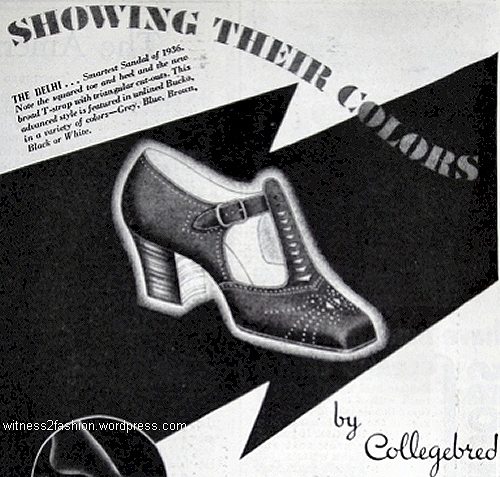 Ad for Square-toed Collegebred Shoes, 1936. Available in Gray, Blue, Brown, Black, or White. Like the shoes in the illustration, they are made of bucko; the brand ‘Collegebred” confirms that these are for teens and young women. They have casual, stacked leather heels. Illustration: Formal Tailored Kid Sandals, 1936. These may not be what we usually think of as sandals, but they look light and appropriate for a silk, rather than a wool, suit or dress. “Nothing smarter for town, sport or afternoon. New ‘dark accent’ colors of suede. Patent. 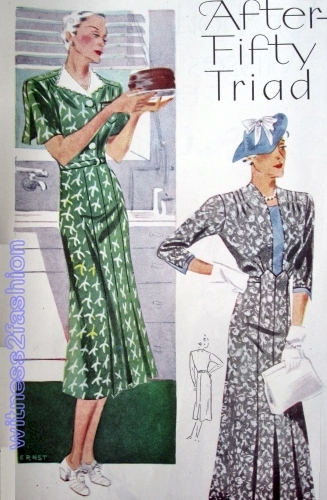 And British Tan calf, the exciting ‘high’ shade.” Walk-Over Ad, April 1936. They are much more open, but not open-toed. All four styles were available in patent leather, and some came in a range of colors (Dubonnet, blue, black, white, brown, British tan, white kangaroo suede, etc.) Style A has square toes and heels and is pictured in bucko. Perhaps I like these sandals because – except for the one with the wide strap – they remind me of the elegant shoes of the twenties. The ad says they are “young” and colorful. 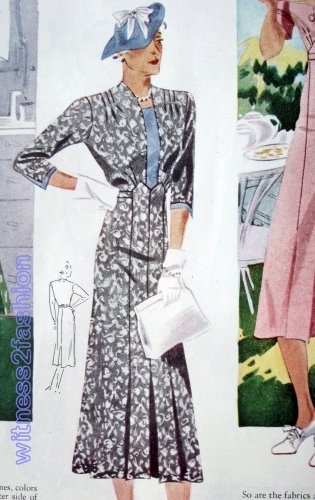 I wonder: Would they have looked old-fashioned to women who had worn similar styles – which were then described as new and “unusual” — in 1928? 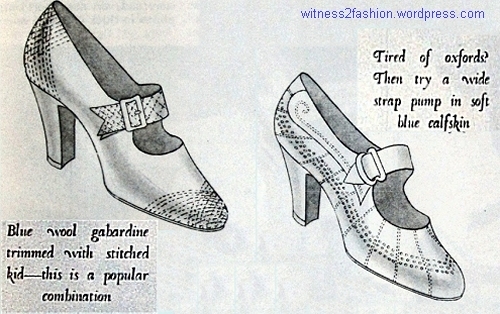 “Unusual” Evening Sandals from Netch & Bernard, Delineator, October, 1928.